Just got my IR probe set up, all seems to be working well except the mesh bed is very bumpy. Tried it on 90 and 361 points, both show similar issue and repeatably as well. I'm using a 216x216mm Printbite surface on 5mm tooling plate mounted with 3x hex standoffs and springs. It has some surface markings (2 small logos and a grid although these do not correlate with the mesh map. I may try and put some blue tape on to see if it is the surface or not. What are peoples thoughts on this? Put a piece of paper on the bed and try again. The ir probe works great if the surface is evenly reflective which with most surfaces especially with any type of markings or coatings is very unlikely. Nozzle contact probes solve this problem. I'm looking forward for your precision-piezo to be back in stock, @DjDemonD, when do you expect to have it back? I'm using a similar size Printbite on a 1/4" cast ally plate, and my probe seems pretty happy and giving quite constant results. Only 5 contact points though, just clockwise from the front left and ending in the center. Do we have contact probes that work with the Duet Wifi now? Yes the Piezo20 probe module works with any firmware. The current production PrintBite seems to be transparent to IR, which is not ideal for the sensor. I think it is picking up the grid lines. You will probably get better results if you choose the grid origin and spacing so that every probe point is in the centre of a grid square. I never solved this issue unfortunately… placing paper lessened the problem but it still persisted. Also, the grid lines do not explain the diagonal lines as otherwise you would expect the waves to travel along X or Y (Or both). Quite disappointing really and may have to give the BLtouch or the new piezo sensors a go. The grid lines could indeed explain the diagonal lines, it all depends on the relationship between the grid spacing on the build plate and the grid spacing you choose in your M557 command. The grid lines are set to 20mm apart, if the IR probe was hitting them, surely this would happen in a repeatable pattern either across X (vertical waves), across Y (horizontal waves), or both (grid like waves). Depending on how big the probing grid is, this may not happen every time but you will still see a repeating wave. How would you see diagonal waves? This diagonal wave also appeared with blue tape covering the surface, although to a slightly lesser extent. Something else must be causing this noise. It also picked up where the blue tape overlapped, so at least I know the accuracy is there. Any thoughts on how to get this probe working? could live with it not working on printbite, but it doesn't make sense to me that it is showing noise on uniform surfaces such as paper and blue tape. Try using a black piece of construction paper first. I know these sensors give amazing results on it if they are functioning properly. I was able to dial in to -.008 to .023 deviations with black paper under glass but on top should work just as well. Otherwise you could try another sensor. I had a similar problem while doing the calibration. I mentioned in this forum too. Like Whitewolf, I used a matte black craft paper under plain glass bed. I cleaned the glass with standard window cleaner to make sure there is no dirt. 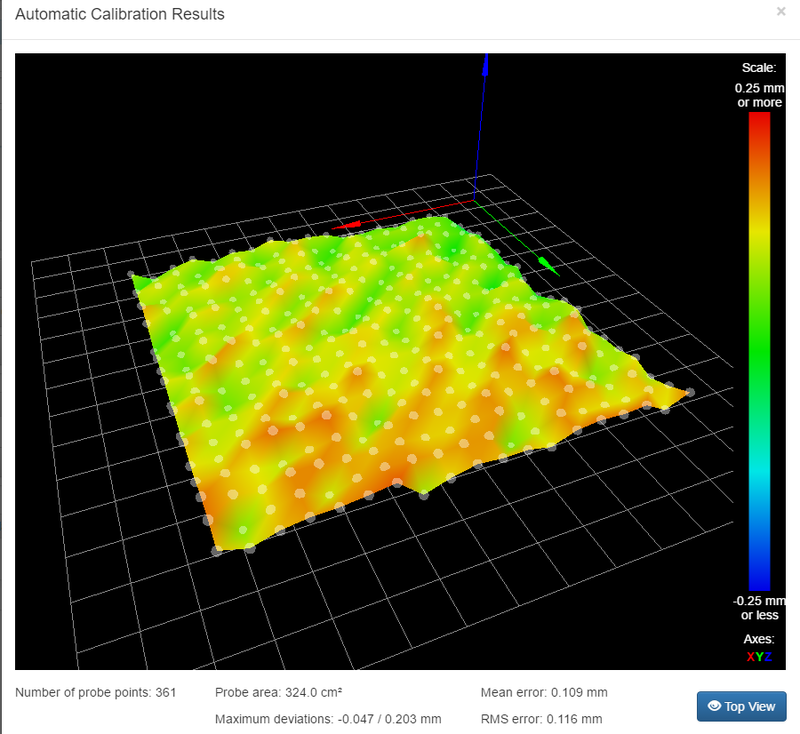 Now I get a repeatable calibration with deviation under 10 microns and good mesh bed compensation. Previously I used PEI surface but I had some scratches due to which I had weird calibration and bed compensation results. Once I used the black paper these problems disappeared. I would suggest you try this. Unfortunately black craft paper wont work for me as I use print bite directly on aluminium tooling plate with no glass. I will get hold of some just to test the probe, but it seems the IR probe is not for me. Disappointing really given that many of DC42's posts in the past have pointed to it working with printbite. Not his fault, but the wiki/blogposts really need editing to reflect this change. Reflect what change? The IR probe worked for me when I had Printbite. I think the formulation of PrintBite has changed. The small sample that I originally tested was opaque to IR. A more recent sample I have been given appears to be transparent to IR, which would account for the difference in results. I will update the fitting instructions. im cheesily grinning at getting a hold of one, they never seem to stay in stock long !! !